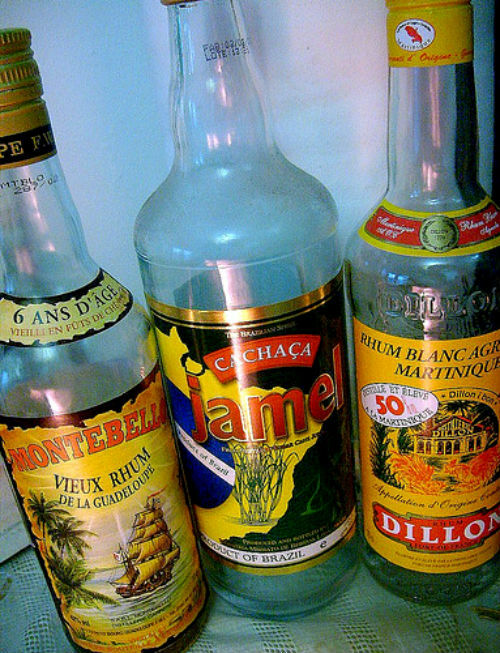 WHAT IS THE DIFFERENCE BETWEEN RHUM AGRICOLE AND CACHACA? I´ve read so many articles and seen so much confuison when it comes to what exactly is the difference between rhum agricole and cachaca. And then there`s rhum Barbancourt, is it or is it not a rhum agricole? So i got the bright (?) idea to write a blog post and try to see if i can sort out what the differences are. I might not have it all clear either. To a large part i have Ed Hamilton and all the fellow members of the Ministry of Rum to thank for what i today know about rums. If i have missed anything or have something wrong here, or if there´s more to it, please feel free to comment. Cachaça is distilled from fermented sugar cane juice while most (but not all ) rum is a distillate of fermented molasses. Cachaça is typically distilled to between 38 and 48% abv while rhum agricole in the French islands is distilled to about 72% abv. Then of course, Cachaca must be made in Brazil while rhum agricole if made in Martinique must carry the AOC mark. Some people says cachaca should be called rum and others says rum should be called cachaca..I myself call rum for rum and cachaca is cachaca and rhum agricole is, well..rhum agricole. And sensorial – they taste completely different. Rhum agricole is made from pure sugar cane juice which has been fermented and fermentation begins within hours of the cane being harvested. Martinique is the only geographic area in the sugar cane spirits industry, with an Appelation and rhum agricole made in Martinique carries the AOC or Appelation d’origine Controlée mark. Rum from molasses is also produced and its called ‘rhum industriel’ or ‘rhum traditionnel’. Rhum agricole is distilled to about 72% abv. Rhum agricole is also made in French Guyana and two of the most known brands is La Belle Cabresse and La Cayennaise. These rhum agricoles has a slight different flavor than the agricoles made in Martinique. La Belle Cabresse for instance is less refined with a spicy floral note and a lot of flavor. I have only tried La Belle Cabresse, but La Cayennaise is said to be sweeter and rounder and a bit less herbal but with a distictive agricole flavor. Very interesting rums. On the whole, rhum agricoles are very diverse even within the same island. As for the “terroir”, its not just the soil and type of cane that is used, its also the tradition of the spirit which includes the fermentation, distillation, and blending and its not limited to that. The rhums from Martinique are lighter and more refined than the rhums from Guadeloupe for example, which are heavier and in my own opinion much more “grassy”. The AOC or Appelation d’Origine Contrôlée mark was adopted by the Martinique distillers in 1996 and it is unique to the rhum of Martinique. Rhum agricole can be bottled in Martinique or France but i`ve heard they may tighten the regulations so that the AOC mark can only be carried by rhum agricole bottled in Martinique. The Martinique AOC regulations were adopted to improve the quality and value of their products. Rhum Barbancourt isn`t considered a rhum agricole even though its made from sugar cane juice. It seems to be in a class of its own. It has been suggested that sometimes the sugar cane juice is mixed with concentrated sugar cane syrup, but i dont know if there´s any evidence for it. There isn`t much information on how this rum is made. 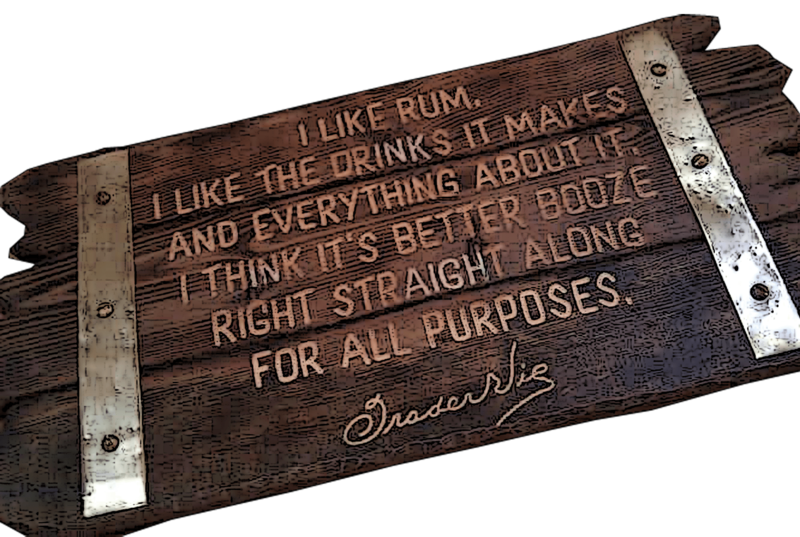 It certainly is a very fine and good rum. There is two versions of the 15 year old Reserve du Domaine. Its the first version that has a serial number on the back and a newer version that is labeled Estate Reserve and that do not have any serial number. The old Reserve du Domaine is said to be darker, richer and smoother while the new version is a bit sweeter, lighter and a bit less smooth. i haven`t been able to compare them myself. The difference between them is most likely to be because of the chill filtration on the rums that are for export to non-tropical countries. The chill filtration technique is used to avoid the deposits or haze which could temporarily occur when the bottles are subject to colder temperatures. Its also a commercial process to standardise the product, its even written on Barbancourts home page that they use chill filtration. Unfortunately the chill filtration removes esters and aldehydes, as well as some of the rums natural oils, which leads to a altering of the flavor profile and general mouthfeel of the rum. According to Brazilian law cachaça must be distilled from 38 up to 54% alcohol by volume and its bottled at 38-48% abv. Up to 6mg sugar can be added. Cachaça can be made from fresh sugar cane juice or melado which is sugar cane juice which has been reduced but without removing any crystalline sugar out of the juice. The harvested sugarcane is washed and pressed through large metal rollers to extract the juice and its this first pressing that makes cachaca. The juice is then filtered to extract any cane fragments etc before the process of fermenting. Cachaca is fermented in wooden or copper vats and then boiled down three times and the result is a sticky concentrate. The aging process yields a cachaça with a smoother taste and most often a yellow or caramel color. Premium cachacas are distilled in such a way that the sugarcane flavor isnt lost. To be labeled “aged” a cachaca must be aged at least one year according to Brazilian law. As far as i know they use at least 26 different woods…woods with exotic names such as balsam wood, jequitibá, guarandi, umburana, ipê, jatobá, imburana, cedar, freijó….or garapeira which is used to age for example Abelha Gold – an artisanal cachaca with lots of flavor and personality that i really like. Garapeira is a type of native Brazilian Ash which adds it´s own sweetness and spiciness – but without changing the flavor of the cachaca itself contrary to what oak barrel aging does which adds that familiar vanilla or toffee notes that we are used to from molasses rum. 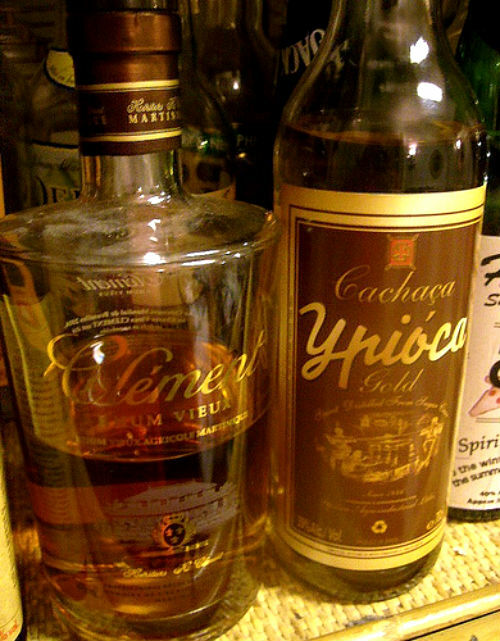 But cachaca isn´t only aged in Brazilian woods, Leblon for example have their cachacas rested or aged in cognac casks while Moleca Gold is aged in oak barrels. Most often the cachaca producers uses a leavening agent in the production of their cachaca, meaning that during the stage of fermentation they will add corn meal, corn flour or rice bran, to the sugar cane must. And that these grain additions will add distinctive flavors and aromas to the cachaca besides producing the alcohol. This is a fermentation starter mash that is made from cane juice and toasted corn meal which is generally and tradtionally practised. Traditionally cachaça is fermented using indigenous yeast strains that are naturally occurring in the cane. Artisanal cachaça is typically made in batch potstills, while industrial cachaça is made with continuous column stills. Then there is also a third type of cachaca that is made by adding caramel or wood extracts without any aging – called “yellow” cachaca – and the addition of the wood extracts and caramel gives the “yellow” cachaca a much sweeter taste. So these are the main things that differentiates cachaca from rhum agricole as far as i know. Then when it comes to rum, apart from rhum agricole, its made from molasses, a totally different way to produce this sugar cane spirit. To round this up i made a ti punch with palmsugar and a ginger caipirinha. 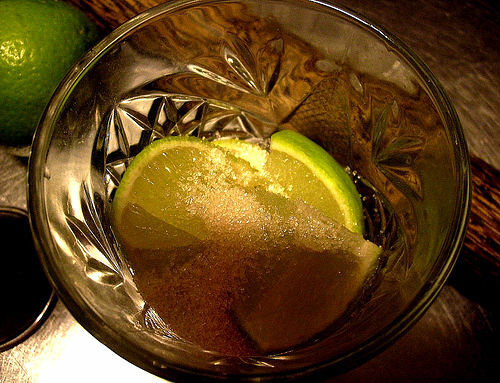 Start squeezing the lime and drop into the glass. Add the palm sugar syrup and the rhums and stir to mix. Add a cracked ice cube if you like. 0.5-1 oz simple syrup or 1 heaped tblsp raw sugar. I use raw sugar even though its not dissolving as easily as the traditionally used superfine sugar because i like the flavor of the specific raw sugar i have (Billingtons golden natural unrefined cane sugar) better. 1/2 to 1 lime depending on size. Cut the ends off, then the pith and cut it in pieces. 2 cm piece of fresh ginger,sliced. 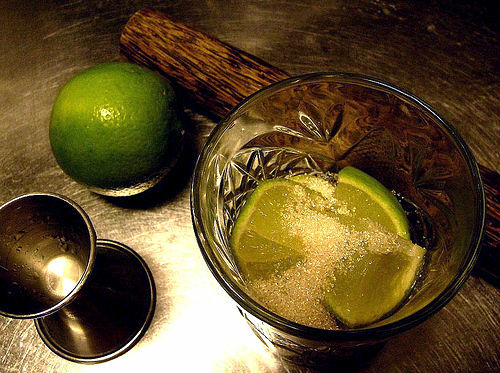 Muddle lime, sugar and ginger in a rocks glass, add crushed ice and cachaca, stir well. 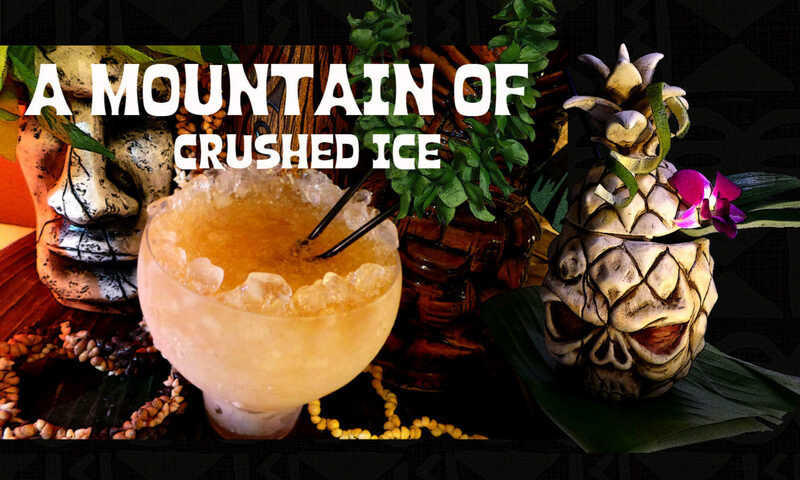 Fill up with more crushed ice if needed. Garnish with a lime wedge. Thanks for your kind words Matthew! I can believe the Barbancourt is good paired with a cigar even though I don`t smoke myself, but I have smoked an accasional cigar tho…. I like your not-a-review review style, and the very eclectic angles on the subject. I’ve read a few of your articles here today, and this attempt to tease apart the real distinctions between Agricole, cachaca, and particularly Barbancourt (the only one among these 3 I’ve actually had) was very informative thank you. It so happens I am a cigar smoker and I agree (from your El Dorado article) that the E.D. 15 pairs well here, but even better is the Barbancourt 5 star, perhaps one of the best general cigar pairing rums around! AOC is Appellation d’Origine Contrôlée (AOC) and is the French equivalent to EU’s Protected Designation of Origin (PDO). Very informative post…I will check my local liquor store on the way home from the office to see if ANY of these are available…thanks again. Very good and informative site. I would like to contribute with the following about Cachaca. 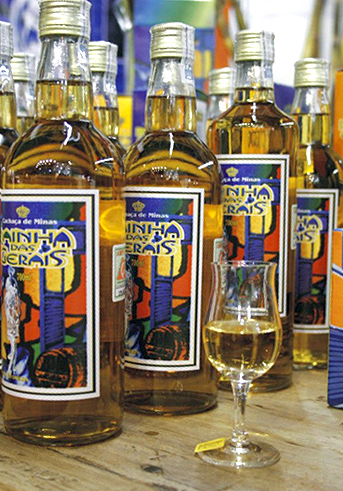 CACHACA – “is the typical and unique designation for the sugarcane liquor produced in Brazil, with an alcohol content of 38-48% and 20 degrees Celsius. If these standards are not met, the drink cannot be marketed as Cachaca, but receives the designation of ‘aguardente-de-cana’ (sugarcane brandy). 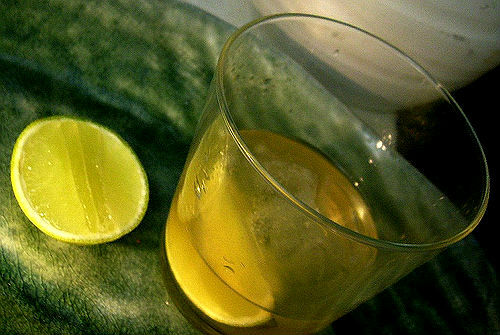 There are two kinds of Cachaca, white or yellow. And can be “stored” or “aged”. Cachacas can be Premium (it consists of 100% sugarcane, aged in suitable barrels with NOT MORE than 700 lts (185gal) capacity for a period not shorter than 1 year. Extra-Premium: same as before but, for a period not shorter than 3 years. Cachaca is the only distilled product that is aged in more than 20 different kinds of Brazilian tree-barrel, just one of then is oak, brought by the Portuguese during the colony time. 4 of these trees are considerer the best because they don’t change the color of the Cachaca, it gives them an slightly yellow tone and a mildly astringent taste to the Cachaca. I enjoy very much cachacas aged in AMBURANA,which is often used in ‘blends’ of Cachaca aged in European oak barrels, as intensifies the aromas and flavors of the bouquet. Well..i have had some REAL premium cachacas that normally never leave Brazil and so since there´s about 5000 cachacas in Brazil and only a fraction is exported – plus – usually those exported are made to “suit” the foreign palate – the mainstream palate that is – and so those cachacas, not all but most, are filtered and tinkered with to become quite mainstream and not so original. There are exceptions though. But there´s no wonder that many people outside of Brazil never get to taste a really good handmade artisanal product and they do exist, i know for sure. Then we have rhum agricole…there´s some REAL good expressions there too…and luckily those are more available. Then we have Barbancourt…a VERY good rum in my opinion. There are also rums that are made with the so called sugarcane “honey” – not molasses or fresh cane juice, but it´s evaporated sugar cane juice, (not sure if Barbancourt belongs to that category in part, like half evaporated sugar cane juice and half fresh) an example of such a rum and a premium at that, is St Nicholas Abbey from Barbados. And it does NOT taste like rhum agricole but it`s not a molasses based rum either. Just got back from Haiti. Most of the people there call rhum..agricole. 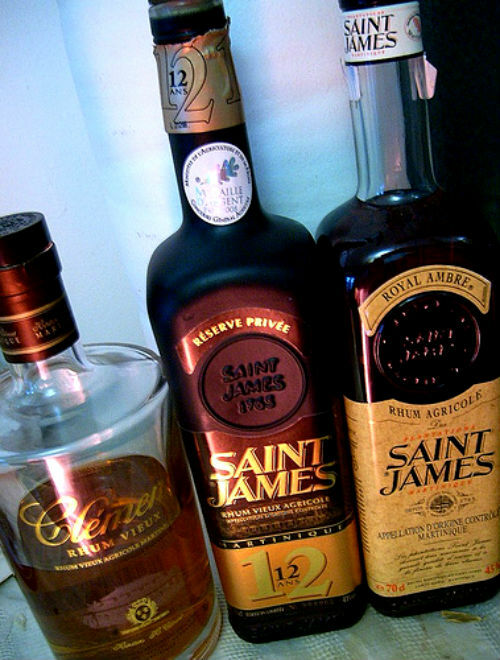 Personally when tasting Barbancourt or St. James, I find subtle differences. However they are more akin to being siblings than distant cousins. Chachca close, but more like a first cousin. Isn’t the appreciation of rum fun! For those of us who are familiar with American whiskey history, the confusion is not at all surprising. The answer is simply that “what is r(h)um?” is political. It’s that simple. “Rum”, is a wonderful spirit whose origins were a way to recycle the waste from sugar production (i.e. molasses). There are a lot of associations with the slave trade, of course, and to SOME people, rum is considered somewhat politically incorrect (too bad for them). “Rhum”, meaning Rhum Agricole, is a result of France’s ability to enforce it’s “appellation d’origine contrôlée” laws, which basically forbid anyone to call their product “Rhum” unless made directly from fresh sugar cane juice… IN FRANCE. This is similar to our own laws governing the labeling of bourbon whiskey. Note that “France” includes Martinique and Guadaloupe, and the agricole rum produced there is recognized by mainland France (and the European Union) as such. Unfortunately for the Haitians, Haiti (the government, not the people – as Americans we can understand that) are not thought of highly by France (again, probably the government – not the people). Barbancourt was once considered Rhum Agricole and is, even after the disasters of politics and hurricanes, still one of the finest rums in existance. Some of us who look at the history of spirits in the western hemisphere have a nagging suspicion that France’s extension of the AOC to include the French Caribbean was, at least partially, a slap in the face to Haiti for enforcing its independence. It would not be the only such example, you know. there’s something about being in St. Barths, sipping Rhum Punch made with Rhum Agricole -that cannot be duplicated anywhere else in the world. And you wouldn’t want to! When in Rio you sip something else. UPDATE – This post have been re-posted since it got erased by a clean-up process and it originally had 51 comments but the 13 comments above are what was possible to restore, sorry. In reply to Lou Lou! yes most of the bottles are aged rhum agricole except the Dillon. But that doesn´t matter because the pics of the bottles are only there as examples of rhum agricole. As for rhum agricole and cachaca, they are similar in flavor but not the same in my opinion. By definition, aguardientes are strongly alcoholic beverages, obtained by fermentation and later distillation of sugared or sweet musts, vegetable macerations, or mixtures of the two. This is the most generic level; by this definition, aguardientes may be made from a number of different sources. Fruit-based aguardientes include those made from oranges, grapes, bananas, or madronho. Grain-based ones may be made from millet, barley, or rice and tuber-based aguardientes from beet, manioc, or potato, and finally what are classed as “true” aguardientes from sugarcane and other sweet canes, including some species of bamboo. Under this definition, many other distinct liquors could be called aguardientes, including vodka, sake, pisco, and certain forms of hard chicha. In Brazil, a beverage known as cachaça or pinga, considered distinct from traditional aguardiente. I think you nailed it Dominik! It is difficult to compare Rhum with Ron [to avoid to get confused with Rum, you simply can use the Spanish term. which comes down to Molasses rums] and Cachaça. Ron is usually sold aged [even the white varieties] – you could discuss about it, but for me the Añejos are the rons, which are expressing the most the true nature of Ron / Rum. Cachaça is sold aged and unaged. But usually it is short aged or unaged, which is displaying the main character. Further the traditional aged cachaça uses domestic rainforest wood, which has a completely different impact on the final product than oak. Due to the low distilling temperatures, Cachaça reminds me with its vegetal character more on Tequila, then on rum. Rhum Agricole can be seen as two quite different products: white Rhum and aged Rhum. The white is usually sold at 50% abv – it bears green flavors [without being as green as Cachaça] – the perfect base for a Ti’Punch. Aged Rhums I see more like Cognacs from the Caribbean. They often use Alembics to distill and also use other French methods for production. Last but not least, they are even using often the French age statement to present their Rhums. I think, that you cannot really substitute a Martinique rhum with a golden rum – both products are hugely different [a gold rum, is usually mediocre – in between cheap white rums and precious añejos]. Rhum has a much spicier nature, hasn’t got so many vanilla and dried fruit notes. At the end, what counts is, that we have 3 completely different categories, and every category has its own charm. Tiare, as you may know, my position on “rhum agricole” has been well published. The conclusions of this article was simply that “Rhum Agricole AOC Martinique” (1996) is a subset of the general term of “rhum agricole” – which has been used for over 150 years and simply means “cane juice rum” (which should be the preferred term). Author Ian Williams agrees. I have spoken personally with Barbancourt on a number of occasions and I can assure you that their fine product is absolutely a pure cane juice rhum agricole (although they prefer not to use that term as they still resent Napolean’s attempt to ruin their economy). 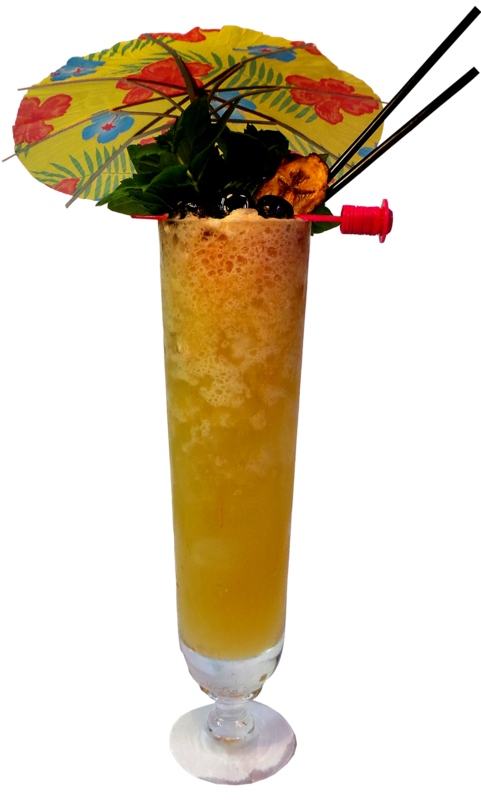 The notion that Barbancourt is made with anything other than cane juice is based on the unverified opinion. 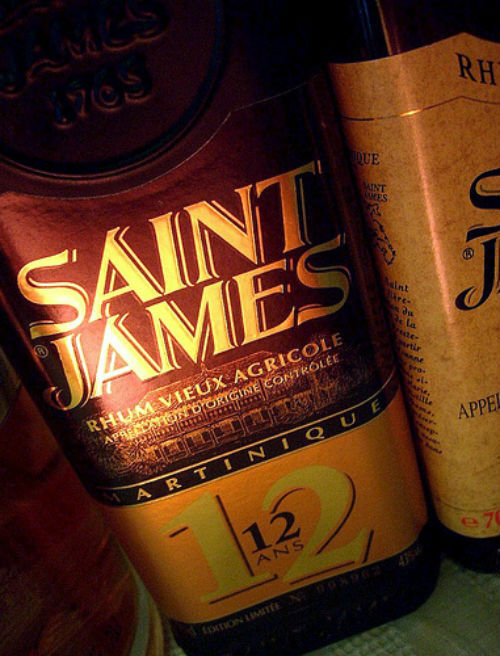 Indeed the same resource notes that St. James (Martinique) does indeed make and keep a concentrated cane juice available for later distilling into “rhum agricole”. Go figure. And no less than Mr. Hamilton at the MOR once admitted that by definition artisan cachaca from Brazil could equally qualify as cane juice rhum agricole. The truth is that there are no real all-encompassing standards for any form of rum or cachaca. When reading your interesting article on the Barbancourt it seems clear that they use some sugar cane syrup in their rums. Interesting way they have to produce their rum and the final product is indeed a fine rum,i`m glad they have gone back to use the copper still. Interesting. I didn’t know about leavening agents in cachaca. About Barbancourt, I am pretty sure they use some sugar cane syrup in their rums. I visited the distillery and this is what the distiller told me they did. No reason I can think of for him to lie about this. I’d say Barbancourt was a sort of ’semi-agricole’. Besides the use of some cane syrup, another difference is that it is distilled to a very high proof and then diluted. So far as I know this is rather difference to the Martinique rums. Rick, i would suggest Neisson blanc or la Favorite blanc, can`t decide which one. If you had to suggest one rhum agricole for people to try that have never had it, which one would it be? Well Petter, not..really, i dont think there is any substitution for rhum agricole as it has a taste of its own, but if you didnt have it, well.. But if you dont have a golden rum i wouldnt use agricole, i would use a dark rum. I guess that goes both ways then? If I want to use my Rhum Agricole I’ll substitute a golden rhum. Petter, i think that if i didn`t have rhum agricole for one of the bums tikidrinks (martinique rhum in his books)i would go for rum, i would probably use a golden rum. Even though cachaca is made in a similar way as agricole i don´t think it tastes the same. I’ve been wondering this very same question for quite some time, and it’s nice to finally have a reasoned answer! R. Agricole is not that common in tiki-drinks of our favourite Bum. What other rums could be substituted with R. A.?